“A great host with exciting stories to tell is absolutely invaluable,” says Bernt Bucher-Johannessen (photo: HANEN). 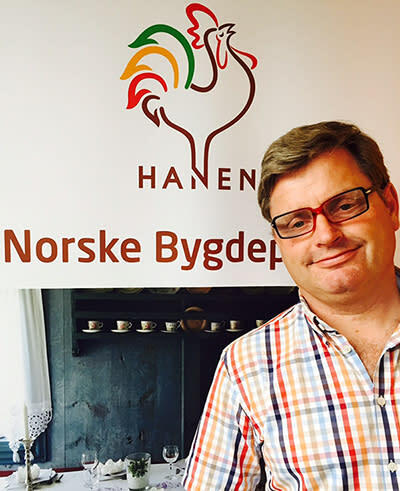 He’s the general manager at HANEN (“The rooster”), the Norwegian trade organization for rural tourism, farm experiences and freshwater fishing. More simply put, it’s “a network of experiences” – showing the way to the country’s rural gems. “We are comprised of nearly 500 businesses throughout Norway, within food and drink, accommodation, and activities both form adults and children,” he explains. The coming Tuesday, HANEN are launching a brand new mobile app that will lead the way to local experiences all across the country. “It will make it very easy to find unique experiences. The word ‘unique’ is perhaps somewhat worn out, but in this context I actually think it’s quite correct and credible,” says Bucher-Johannessen to Visit Norway. Norway has a lot to offer, but the hidden gems are … well, precisely, hidden. Memorable local food experiences, fun activities and charming accommodation options are waiting to be discovered. The app provides travel planning and directions, saved searches and favourites. These are all available offline. “The app’s map functionality is the first priority, making it easy and simple to navigate – to farms, places to stay, and small, charming shops that are open in the summer season and would otherwise be hard to find,” says Bucher-Johannessen. Initially the app will be launched in Norwegian, in the App Store (for iPhones). Soon, English and German versions will arrive, as well as support for Android phones. Meanwhile, you’ll find maps, adventure routes, tips and news on HANEN’s website. It’s a good idea to get familiar with the possibilities before setting out on a trip. “First of all, get orientated. Are you heading to Bergen, Western Norway, or Trøndelag? Are you driving or flying? Should you make stops along the way? Once you know where you are going and how to get there, you can sit down and explore,” says the HANEN boss. Spectacular Norwegian nature tends to attract attention on social media. Here are some of our favourite pictures from the past weeks.